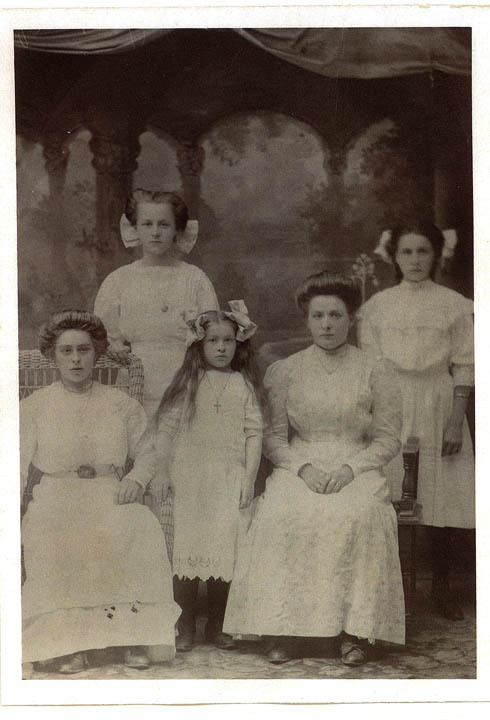 The five daughters of Damiano and Oliva Genetti: Ottilia (Tillie), Esther, Angela (Ann), Addolorata (Dora), Erminia (Erma). Photographed abut 1909 in Pennsylvania. It’s only four months away! The Genetti Family Reunion 2016 is scheduled for the weekend of October 7 – 9 in Hazleton, Pennsylvania. Have you mailed your reservations yet? Here’s the link to download your reservation form: 2016 Genetti Reunion Reservation Form Update. There has been one small change to the original Reservation Form that we posted earlier. So make sure you download the updated version, posted on June 8th. Remember, reservation deadline is September 1, 2016! We have received press from TrentinoHeritage – an informative blog about families from the province of Trentino in Northern Italy (used to be Tyrol). They cover culture, genealogy and history in Trentino. Click here to read the blog post about our reunion. And while you’re at it, why not subscribe to TrentinoHeritage – just scroll down the right side of their blog until you see the subscription box. Notices have been posted on several genealogy sites (Ancestry.com, Italian Genealogy) announcing the reunion. Plus a link was posted to “Chei da Chastelfon”, a Facebook group managed by Giovanni Marchetti of Castelfondo. Giovanni, along with other members of the group, upload vintage photos and family stories, picturing the by-gone days of their beloved village. Through Giovanni, our Italian cousins and most of Castelfondo now know about our Genetti Family Reunion! Here’s an idea on how to include cousins from both sides of the pond – how about setting up a webcam during our reunion? This would offer cousins in Castelfondo and those unable to attend, a live online view of the weekend’s festivities and programs. What a wonderful way to make the world just a little bit smaller and include all Genetti cousins! Do we have any computer geeks out there willing to take on the challenge? Another option might be to film several videos of the weekend. We could include video interviews with attendees, casual shots of cousins chatting, plus capture both Saturday afternoon and evening programs. The clips could then be uploaded to our Genetti YouTube channel and posted on our website for future viewing by all cousins in the USA and Italy. I’m sure these videos would become a treasured part of our family archive, especially for future generations. Do we have any volunteers who are video aficionados? Please email me through our Contact Page if you can help us with this exceptionally important task! ← Important Mailing List Info! Please Read!